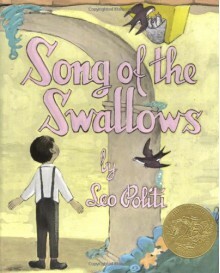 by Leo Politi I've never read a Leo Politi book before today, but I'm familiar with his paintings. Ama used to have one hanging in her house. I like his style a lot. I didn't like the story as much as his artwork, but it's almost impossible not to share in Juan's enthusiasm over the swallows.